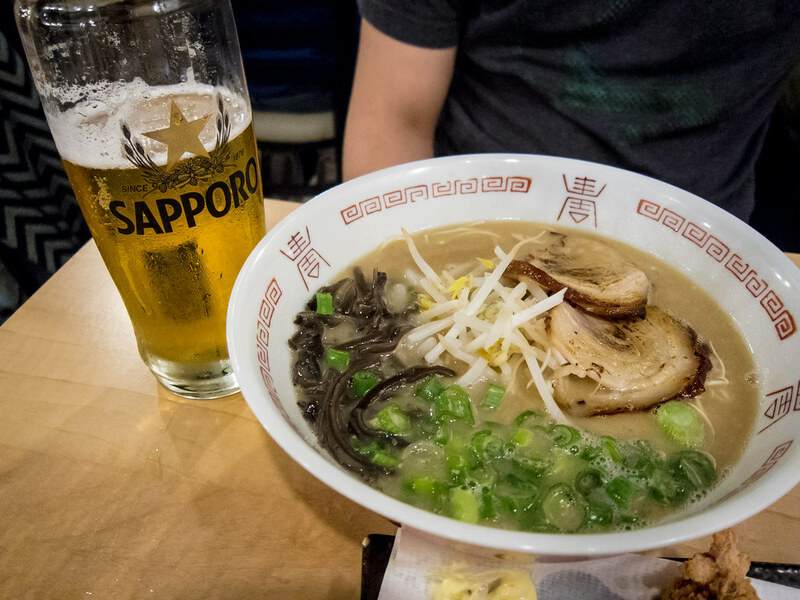 Has the ramen fad in Toronto faded? Is ramen old news? In my opinion, not really. In fact, I feel like Ramen’s been embraced and absorbed into the Toronto food scene and I for one would be ecstatic to see ramen become as popular and ubiquitous as pho. 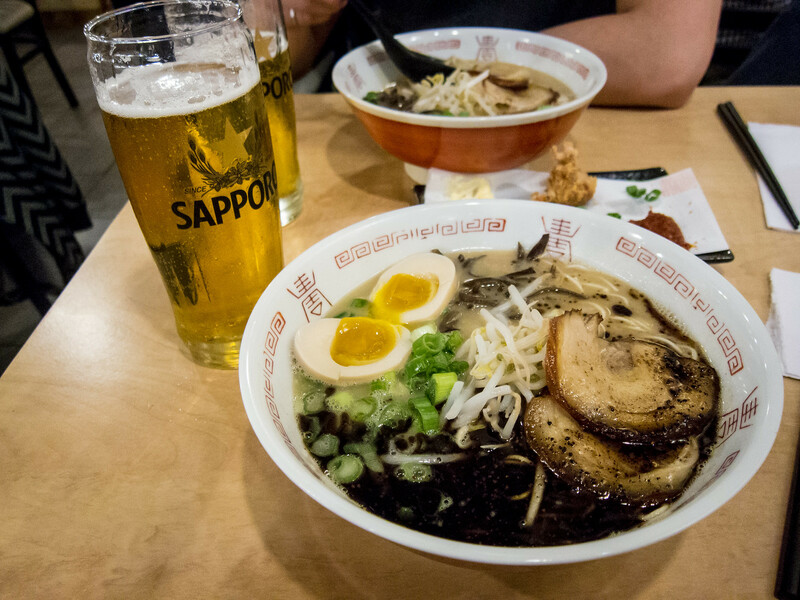 The one worry with more and more ramen shops popping up is of course quality and authenticity. 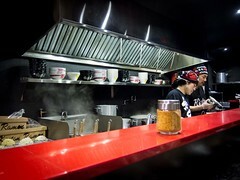 I believe that good food will speak for itself and hope that Toronto will develope our own style of ramen. 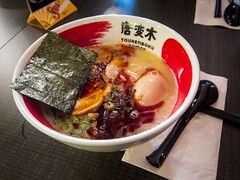 There’s plenty of room for new ramen shops and diners will keep them on their toes as our tastebuds set the benchmarks. 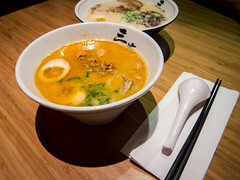 Hakata is one of the newer ramen shops to open in North York. Atmosphere: Located on a quiet stretch of Yonge between Sheppard and Finch, Hakata’s old school wooden facade stood out. 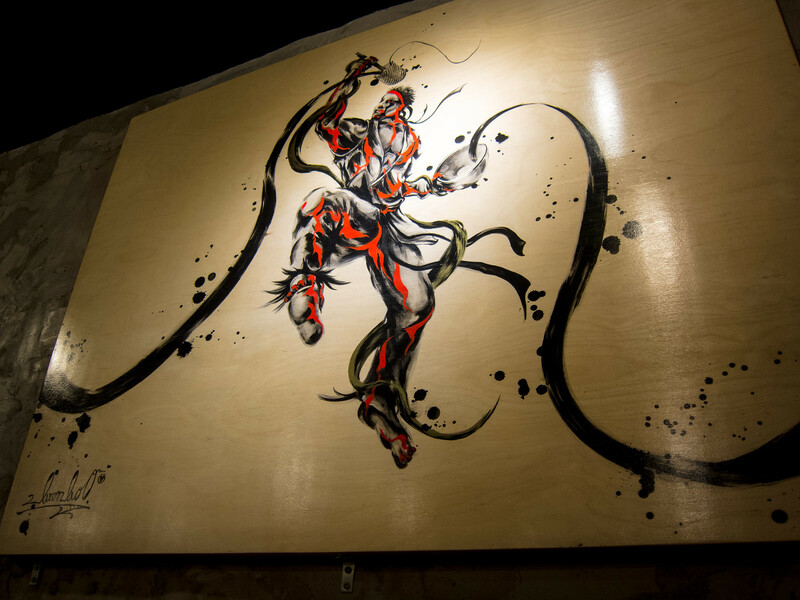 Inside, large paintings featuring Street-Fighter-like characters preparing ramen decorated one wall. The restaurant was small with a row of seats in front of the kitchen and about 20 seats at tables. Like most ramen shops, I wouldn’t recommend visiting with a big group. The space was relaxed and quiet. Service: Complimentary wi-fi was provided, a nice extra at any restaurant (especially for bloggers who run out of data every month *cough*). At the time, there was also a discount offered for signing in on their Facebook page. The discount was only applied per bowl of ramen per sign in. Our ramen bowls arrived piping hot and service was friendly. 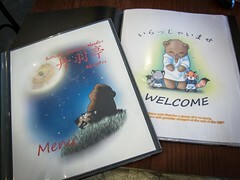 Food: The menu at Hakata was compact and focused, a good sign for a specialized restaurant. There were other signs that listed limited time specials in addition to their core items. I had originally planned to order the TanTan Men but they were all out for the day. 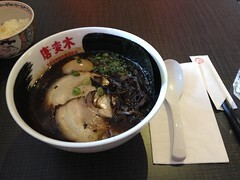 Inside I chose the Black (roasted garlic oil) Tonkotsu, while The Hubby went with the original Hakata Tonkotsu. 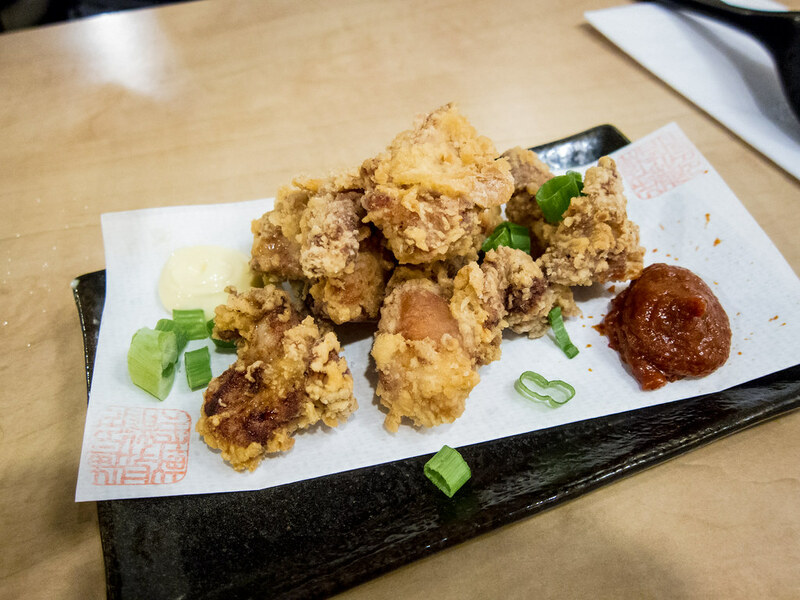 We also shared an order of Karaage, which was good. The chicken was juicy, crispy and came with a super tasty spicy sauce and mayonnaise. Breaking down the ramen to broth, noodles and toppings. Hakata gets an A on broth, B+ on noodles and B- on toppings. 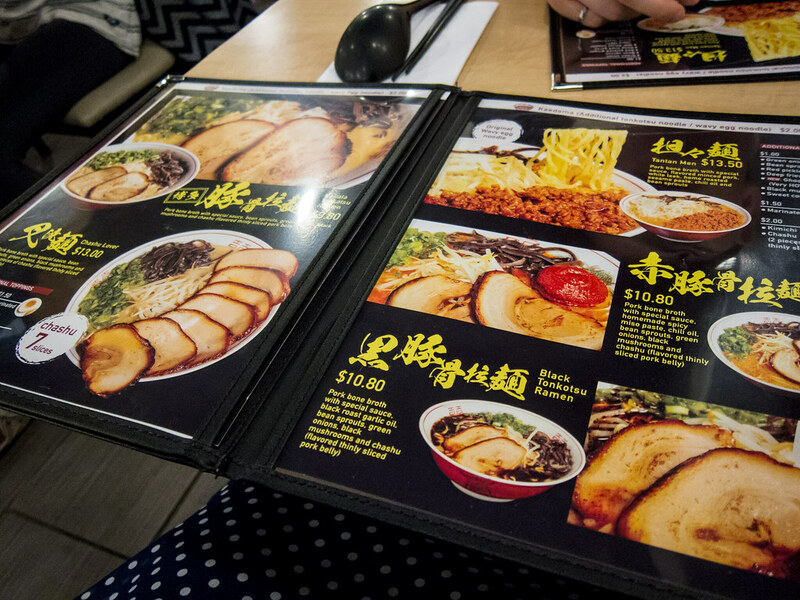 The broth was thick without being oily and very rich. I thought there was lots of flavour and just the right amount of salt. In the past, I’ve ordered “black” ramen at other restaurants and was disappointed with an overwhelming bitterness. At Hakata, the roasted garlic oil added more flavour and umami without being overpowering. It was a great balance. Thin noodles were used, there was no option to customize, which was fine. I liked the consistency and texture of the noodles while The Hubby would’ve liked a thicker noodle with more surface area or curl to pick up the broth. As for toppings, I felt the selection at Hakata was limited (no nori) and a touch more expensive relative to other stores ($1.50 for a seasoned egg). The slices of rolled chashu were buttery soft didn’t have much flavour. Not bad, but not great.